Welcome, bidding and blessing by the Dean. First lesson by Mrs. Averil Trott, Chairman S.E. Surrey Branch. Second lesson by Lady June Onslow. Third reading by David Burleigh, pupil of the Royal Grammar School Guildford. Address by Michael Moore, Chairman of the Central Executive Committee. NSPCC. Peggy lived from 1916- 2008. Peggy was a former Secretary of the ‘Friends’. This service took place at the Guildford Crematorium and was led by The Revd Canon Angela Weaver. The address was given by Hilary. 1928-2011 John was a member of the congregation, a member of the Cathedral Fellowship and a Steward. The service was conducted by Canon Angela Weaver who also gave the tribute. The sermon was by the Dean. The prayers were led by Canon Nicholas Thistlethwaite. 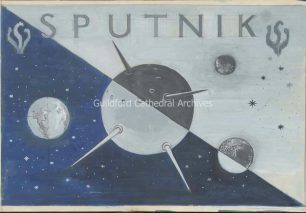 There was a retiring collection in aid of Guildford Cathedral. The Nativity was acted by members of the Cathedral Sunday School. The singing was led by the Choristers of Guildford Cathedral Choir directed by Stephen Farr. The organist was Louise Marsh. The music was sung by the Choristers of the Cathedral Choir. The Stag Hill Phil was directed by Mr Patrick Dienes-Williams. The Organist and Master of the Choristers was Katherine Dienes-Williams. The Gordon Memorial Service of the Gordon Boys’ School . Prayers read by the school chaplain, The Reverend F. A. Giles. The sermon by The Reverend J. Harkness, OBE GHC Lth MA, Chaplain General to the Forces.